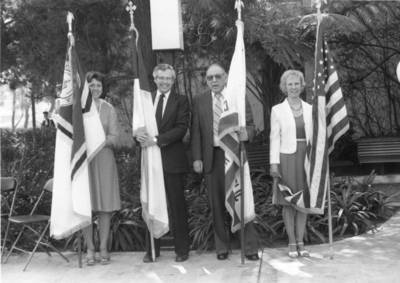 "Flag bearers at the 125th anniversary of Chapman College, Orange, Cali"
Flag bearers at the 125th anniversary of Chapman College, Orange, California, 1986. Left to right: Lori Tschetter, Jim Miller, Emery Owens and Sybil Thomas. BW Photograph; 5" x 7"